Thank you to everyone who has already given! 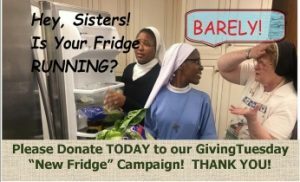 During our Advance Day Giving Option, we have raised $2450, and now we’re only $50 away from reaching our goal to purchase a new commercial grade refrigerator. Please help us by sharing your blessings and our donation page with your friends and family on social media one more time! If we are blessed to exceed our goal, we will stock the new fridge for Christmas!